Digital thermometer-hygrometer is designed for measurement of temperature and relative humidity of indoor air, warehouses, freezers, vegetable stores, hen houses, cellars, steam rooms or outdoor temperature and the supply air in heating, ventilation and air conditioning. large size of digits LED (45h35 mm). supports up to three temperature sensors. remotion of digital temperature sensors from the device up to 150 meters. sequential automatic indication of each of the sensor temperatures. Memorizing of the lowest and highest temperatures. Installation of the lower and upper temperature limits. Output for connection of the alarm. The maximum capacity connected to the signal output not more than 500 Watt. Digital temperature sensor 1 pc. 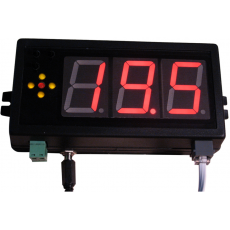 Digital temperature sensor (optional up to 2 pcs.). Relative humidity sensor (1 pc. ).